Moto Morini in the 1950s and 60s had a superb racing history, based around 175 and 250 singles in both production-based and GP racing. Post-war, they had started racing with a 125 2-stroke, based on their road bike, but then went to a 125 four-stroke in GPs. In the early 1950s they moved away from GP racing to production-based racing. This may be because they saw production racing as commercially more profitable; Italian long distance road races were their equivalent of the TT and were what sold road bikes (which was what Morini were all about). The racing Rebello and Settebello bikes were based on their road-going 175 model which itself had sporty road variants like the Tresette and Briscola. Morini's racing variants were based, however loosely, on the road 175 model. This was a 172.4cc (60 x 61 mm) OHV push rod single, with cast iron cylinders and alloy heads. A 6.5:1 compression ratio and 18mm carburettors gave 8.5 hp @ 6,200 rpm through a 4-speed gearbox. The chassis was steel tube frame, with telescopic forks, swingarm and hydraulic shock absorbers. It weighed 105 kg (kerb weight). Top speed was around 60mph. Variants included the GT, Super Sport, Briscola and Tresette. The sporty Tresette Sprint had a high compression piston and 22.5mm Dell'Orto carburettor to produce 13 bhp @ 6,500 rpm and a top speed of 73 mph. Entering production-based racing Morini effectively cheated from the start by producing the Rebello 175. It was an RC30 of its day, as while supposedly a 'road bike' (there are period pictures with lights, etc.) it was really a pure racing machine of which only a couple of dozen were made. They won pretty much everything in Italian production racing for a couple of years at which point they were (probably quite rightly) banned. The Rebello engine mimicked the road 175 in having being a single cylinder displacing 172.4cc (60 x 61mm). There the similarity ended however. DOHCs helped to produce 25 hp @ 9,000rpm; very impressive when one considers that the 1958 250 GP bike had around 32hp. Power went through a 5-speed unit construction gearbox. The chassis was a single cradle tubular frame with swingarm telescopic suspension. Brakes were a 210mm TLS drum front and 190mm SLS rear. The whole packaged weighed only 100kg (dry). Top speed was around 105mph. The success of the Rebello in Italian production racing is well documented (albeit mostly in Italian). In the 1955 Milano-Taranto, a 175-mile city-to-city race on public roads, Mario Preta won the 175cc class with a record average speed of 115.265 km/h (71.6 mph). Furthermore, he finished second overall to Bruno Francisci riding a 4-cylinder 500cc Gilera GP bike (very) thinly disguised as a road machine (126.234 km/h / 78.4 mph). Tellingly, Morini took five of the top 10 places in the 175cc class. Success also came in the MotoGiro d'Italia, a multiple-day stage event for machines up to 175cc on public roads. Emilio Mendogni won the 1955 race, whilst Walter Tassinari won the 1956 race. A fascinating video of the 1955 race, with excitable commentary and an interview with Mendogni can be found on Youtube. The banning of the Rebello was probably the best thing for Morini on two fronts. They had already tried an enlarged Rebello in the 250 GPs and it had done reasonably well, so they decided to embark on a full blown Grand Prix effort which ultimately resulted in 30-year old Tarquinio Provini coming second in the 1963 250 GP world championship to the 'mighty' Honda. These 250 race bikes however didn't have a single part in common with the 175 Rebellos; they were completely different machines. 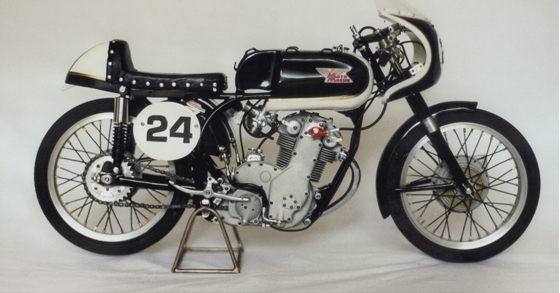 In addition to the GP programme, despite the banning of the Rebello Morini still saw that 'proddy' racing was where the sales were, and as such looked to their 175cc 4-stroke singles launched in the early 1950s that replaced their 125 two-stroke. The 'production racer' version of these was the Settebello; all the others (GT, Supersport, Tresette, etc.) were just variations on road bike themes - if you wanted to go racing you would have always bought a Settebello. The Settebello (unlike the Rebello) was a genuine road bike, which always came with lights, etc., and whilst many ended up on the track, a good many stayed on the road. Throughout its production from 1953 to 1963, the Settebello benefited from a continuous development programme. For example, the first Settebellos were equipped with helical valve springs, but hairpin springs were being used by 1955. Morini also made race kit parts available for sale, in theory allowing any 175 to be brought up to Settebello spec. The 1956 version of the Settebello was a 172.4cc (61 x 60 mm) push rod single, with alloy cylinder and head and a cast iron barrel. A 9.5:1 compression ratio and 22.5 mm carburettor (as demanded by race regulations) gave 15 hp @ 8,550 rpm, transmitted through a 4-speed gearbox. Cycle parts were a single cradle steel frame, hydraulic forks and swingarm suspension, and 160mm drum brakes front and rear. With a dry weight of 101kg in road trim, it had a top speed of 140 km/h (87 mph). By 1962, the Settebello had developed into the ultimate Aste Corte version; 'Aste Corte' meaning 'short rod' after the shorter push rods (not shorter con-rod). These were only for track use and had lower frames and a host of other small differences too. Like the Rebello only a handful of these were made but Morini sold all the bits separately so many older Settebellos were uprated to this spec. Also like the Rebello they were the thing to have in Italian 175 proddy racing (called MSDS, than Formula III). The final 1962/63 Aste Corte version had evolved to sand-cast heads, lighter valve gear, higher 11.5:1 compression ratio, a larger carburettor between 25-28mm, and an output of 22.5 hp @ 10,500 rpm. The lower and shorter frame, Ceriani GP forks, Ceriani shocks with lightened and strengthened oval section swingarm, Oldani magnesium hub brakes and Borrani 18" spoked wheels helped reduce weight to 98kg in race trim. They were able to exceed 190 km/h (118 mph) at Monza. The kudos of the Aste Corte means they sell for up to ten times that of a 175 Turismo, but the irony is they are essentially the same bike and you can buy most of the bits to turn a 175 into an Aste Corte. Settebellos are known to have won over 340 races, 4 Italian Junior championships (Campionati Italiani Juniores), 14 Italian Mountain (Hillclimb) championships (Campionato Italiano della Montagna), several provincial and regional championships, and have taken race successes outside of Italy. Its final major success was the 1973 Italian Hillclimb Championship, piloted by Alessandro Ricca. Riders who rode Settebellos to success in the early stages of their career are a veritable 'Who's Who' of Italian racing. To name a few, Morini GP racer Gianpiero Zubani, 4-times GP race winner Gilberto Parlotti, 2-times GP winner Angelo Bergamonti, GP racer and team manager Roberto Gallina, and of course Giacomo Agostini. Agostini made his dÃ©but on a Settebello at the tender age of 19, finishing 2nd in the 1961 Trento-Bordone hillclimb, beaten only by Morini's works rider, Attilio Damiani. Agostini had purchased his Settebello on monthly instalments from Bergamo dealer Rovaris, but he was soon taken on by Morini as an official rider. Agostini repaid Morini by winning the 175 (F2) class of the 1963 Italian Mountain Championship, taking 8 race wins and 2 second places, as well as the circuit-based Italian Junior (175cc) Championship. By the early 1960s, the 175cc class was gradually becoming less popular, helping to lead to the demise of the Settebello as a competitive racer. Morini produced a SOHC version in 1960. Sadly despite gaining a dÃ©but lap record at Monza of 149 km/h (92.6 mph) it was not developed further. 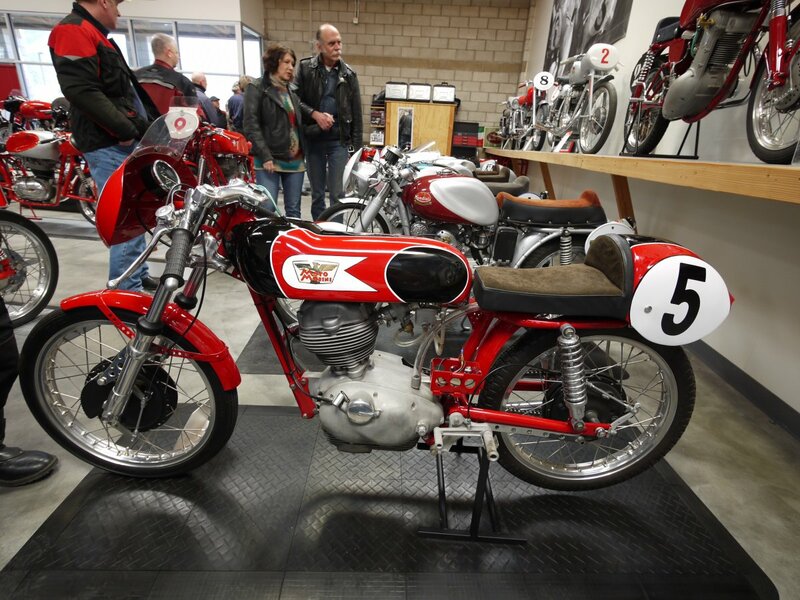 Also in 1960, Morini produced a version with the engine enlarged to 220cc for racing in the Senior (250cc) class. A number of these were ordered by a French distributor. Morini produced a 250 "Settebello" from around 1968 to 1970, primarily for the American market, but this was a completely different machine to the 175 Settebello. It was a road machine with no race pretensions and (with apologies to those who own one) not overly attractive. Nevertheless some were converted for racing in Italy and went pretty well. The quality of the Settebello shows when compared to the contemporary British racing scene. A close equivalent to the Settebello in the UK, in spirit at least, may be the 350cc BSA DB32 Gold Star, in so far as it was popular with clubmen at the Isle of Man and on track and was capable of being ridden to work should one choose to do so. With an engine twice as large as the Settebello, the BSA naturally had a power advantage, the 350 engine giving 30-32bhp @ 7,500 rpm, but was significantly heavier than the lithe Settebello, weighing in at 170kg dry. The comparative power:weight ratios are interesting: 188 bhp:ton for the Gold Star, 148 for the early Settebello, and 230 for the Aste Corte. Quite impressive considering the Settebello is half the capacity of the Gold Star. It would have been interesting to have seen how well the lightweight Settebello with its many successes in Italian road racing could have performed over the TT course. Many thanks to Peter Crawford and Paul Compton for their help with this article. Any errors are of course the Web Editor's own. Images from www.motomorinimotorcycles.eu, and Wikimedia Commons (https://en.wikipedia.org/wiki/Moto_Morini).